Halloween is a holiday adored and enjoyed by many so of course we had to get in the spirit and make some Easy Halloween Cookies that are keto-friendly so you can indulge in the holiday too! It is also a great way to get the kids involved because who doesn't love decorating cookies with low carb, edible frosting. Eat a little, frost a little - that's the pattern I stick to! 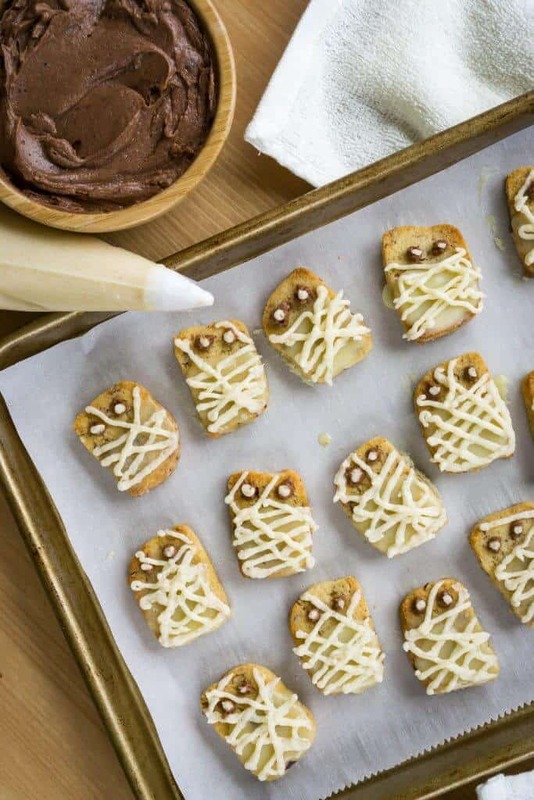 Matt puts on his costume and shows you exactly how to make these simple, easy, keto friendly mummy cookies! Add This To Your List Of Low Carb Cookies! ​Personally, my favorite part is the decorating and eating, but this is also a great cookie without all the decorations. The pecan shortbread base is crunchy, buttery and the perfect simple cookie for all times of year. You can even switch up the nuts you use and toss in some pumpkin pie spice or cinnamon to spice things up! If you like making and eating cookies, this is definitely one you need to try - the frosting just takes it to the net level! Halloween only begins the low carb deliciousness that is about to unfold on you. Cookies and snickers fat bombs are one thing, but with Thanksgiving and Christmas around the corner you're going to get much more. Matt and I are very family oriented and the one thing that makes us feel closest is cooking and creating in the kitchen, which is why we always make it a point to share holiday related recipes. We know what it means to gather in the kitchen and put down your phones for a couple hours while you decorate the mummy cookies or make the low carb pecan pie. We want you to get excited because being low carb doesn't mean missing out, we would never let that happen! We know, Halloween is traditionally a holiday where candy is tossed into pillow cases and eaten by the pound, but why can't the same be done with cookies?! However, if you don't want to go through the trouble of making cookies this year, we HIGHLY recommend you make our Ice Cream Bites. They are Snickers fat bombs that taste exactly like the ice cream Snickers you used to enjoy as a kid! What the heck, Halloween comes around once a year so why not make the ice cream bites and these easy Halloween cookies! Recipe can be quickly added to MyFitnessPal - Search Ketoconnect - Easy Halloween Cookies"
In a small bowl combine all the dry ingredients using a fork. Set aside. In a large bowl melt the butter. Add vanilla extract and half the dry ingredient mixture. Combine using a hand mixer. Add the egg and combine and then add the rest of the dry mixture and mix one last time. In a ziploc bag crush the pecans to desired size and fold them into the shortbread batter, dispersing evenly. Place the entire mixture onto a piece of parchment paper and form a rectangular log using your hands (seen in video). Roll the log up in the parchment paper and freeze for 30 minutes. After 30 minutes have passed, cut the log into 1/4 inch thick cookies - we were able to make 24. Bake for 15 minutes, until golden brown on the edges. Allow them to cool for 20 minutes prior making mummies out of the cookies! Once the cookies have cooled and been glazed (discussed below), you can fill ziploc bags up with the frosting and cut the corner tips so you can pipe out the frosting to make mummies! This is a great time to involve the kids and let them have little fun. Melt the cacao butter in a microwave safe bowl and add the powdered erythritol. Dip the cooled cookies in half way and set them on the baking sheet you baked them on. Prior to placing the cookies in the freezer, use the rest of the glaze to top the cookies. Freeze for 20 minutes - the cacao butter will have hardened and become white. Vanilla: Combine all the ingredients in a large bowl using a hand mixer. Chocolate: Combine all the ingredients, except for the cocoa powder, in a large bowl using a hand mixer. Once the mixture is smooth, add the cocoa powder and mix again.